Given that I’m the kind of person who wakes up thinking about pork buns, I didn’t leave it too long to get to Tuan Tuan, a new Cantonese-Filipino brasserie in Carlton. The restaurant is Australia’s first incarnation of a brand that’s famous in Manila, particularly for its “snow” buns stuffed with barbecued pork. These fluffy baked domes have a topping – a thin layer of cracked cake-like batter – that (vaguely) resembles a snow-capped mountain peak. Eating them starts crisp then subsides into plump squish. The signature char siu-style barbecued pork filling is almost as sweet as the avowedly dessert-leaning pineapple and almond varieties. They’re dainty morsels, baked throughout the day to ensure requisite airiness and freshness, and I can imagine waking up with a powerful craving and transporting myself, zombie-like, to Queensberry Street. 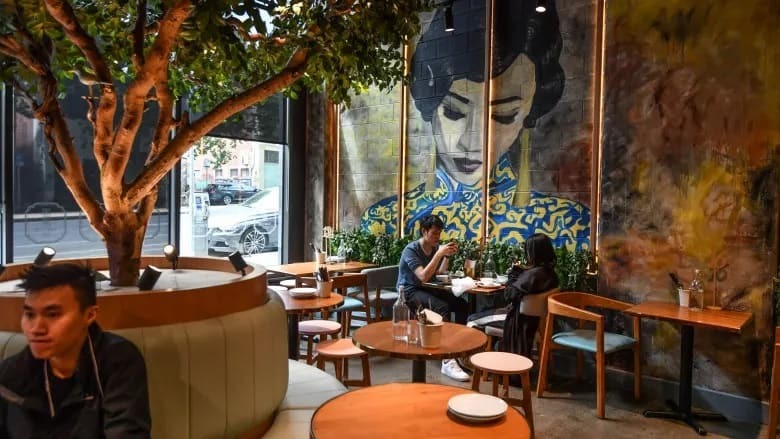 Beyond the buns, the menu is an eclectic melange of Hong Kong-style curries and congee, Malay laksas and Macanese rice dishes. If there’s a thread to the menu, it’s Asian comfort food. The prices are comfortable too, with a keen eye on the student market. I loved the turnip cake, a dim sum classic that’s actually made with radish and is fried to a golden crisp. It’s served with the restaurant’s own XO sauce. Ask for more of this pungent condiment to spark up the gentle, comforting congee, a rice porridge served with Chinese doughnuts. The franchisee for this first Australian Tuan Tuan is Clarion Xie, who also owns the mega-successful Dessert Kitchen in Little Bourke Street. She’s brought her city eatery’s signature shaved ice desserts to Carlton. Fruit is blended with milk, frozen and carved into soft, silky, icy drapes in a purpose-built machine. They’re a bit magical. First published in Brisbane Times, 10th November 2018.